One up with two to play, Schwab had chipped to four feet from thick rough but missed the par putt to extend the match and Dunbar tapped in to become the seventh Irish champion following wins for Jimmy Bruen (1946), Sam McCready (1949), Joe Carr (1953, ‘58, ‘60), Garth McGimpsey (1985), Michael Hoey (2001) and Brian McElhinney (2005). Schwab, who at 17 was bidding to become the first Austrian winner of the title, led one up after the morning 18 holes played in horrific conditions of wind and rain. But it was not long before Dunbar, by far the more experienced of the two, nosed in front. Schwab took two to get out of a greenside bunker at the second to be hauled back to all square and missed a 15 foot birdie chance at the third as Dunbar holed from 12 feet to go one up. The Rathmore man birdied the fourth from 10 feet where Schwab missed a five footer for a half and went two up. And while the Austria birdied the fifth from 20 feet, Dunbar matched him from eight feet to retain his hole lead. How they reached the final. 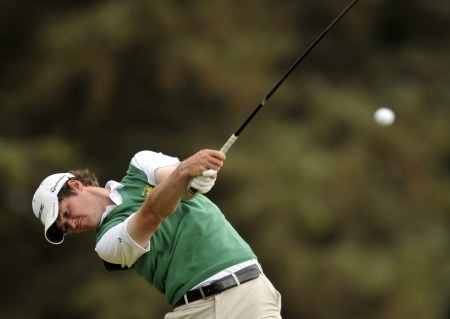 Via randa.orgThree under par for the first five holes, the Northern Ireland man looked in complete control but still had to hole a 10 footer for a half in five at the par-five sixth after bunkering his third with his opponent in deep rough on the right. 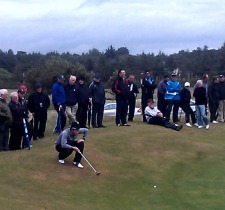 Alan Dunbar on the 14th in the final. Pic via Les Calderwood @4thxjulyDunbar then holed an 18 footer for par at the seventh but Schwab took the hole from a birdie from 10 feet to get back to one down. At the Postage Stamp eighth, Dunbar found a tough lie in the left rough and chipped over the back in three and conceded the hole to go back to all square. However, after he holed a 25 footer for birdie at the ninth to go one up again, the Rathmore man lost the 10th after trouble in the rough. 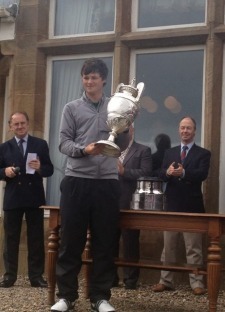 Schwab missed a 15 footer for a win at the 11th where Dunbar had to chip and putt for his par to remain all square. 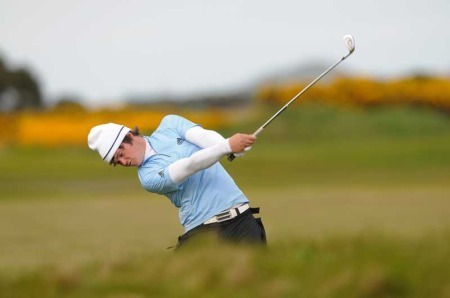 But the Austrian took the 12th after Dunbar hooked his tee shot into trouble and was forced to take a penalty drop. Now one down, Dunbar looked likely to lose the 13th when he came up 50 yard short in two but holed for par from the fringe after chipping long to remain just one down. With raining pouring down, the par-three 14th was halved in pars before Dunbar won the 15th in par to go back to all square. But he lost the par-five 16th to a par after twice finding sand, missing from eight feet after Schwab had failed with a 15 footer for birdie. Now one down with two to play, Dunbar hit back to win the par-three 17th with a par after Schwab had bunkered his approach and failed with a 10 footer. The match was all square heading down the 18th but it was Dunbar who emerged the victor with a nerveless two putt par from 50 feet as Schwab missed the green and failed with a four footer than would have forced extra holes.